Zipcode 53206 – bounded by I-43 on the east, 27th street on the west, North Avenue to the south and Capitol Drive to the north. Lake Effect's Mitch Teich talks with Marc Levine, Professor of History, Economic Development and Urban Studies at UW-Milwaukee. "Zipcode 53206 – the neighborhoods bounded by I-43 on the east, 27th street on the west, North Avenue to the south, and Capitol Drive to the north—has long been recognized as the epicenter of social and economic disadvantage in the city of Milwaukee," states the Zipcode 53206: A Statistical Snapshot of Inner City Distress in Milwaukee: 2000-2012 report. Around the turn of the 21st Century, some thought Milwaukee’s near north side was on the verge of a revival. Many political and business leaders believed there were too many people living in the area for it to struggle indefinitely, and that market forces would be instrumental in bringing the community back. "Heart of City Beats With Opportunity," read a headline in the Milwaukee Journal Sentinel on January 18, 2000. The article pointed to a report from UWM's Employment and Training Institute, saying inner-cty neighborhoods needed "a little TLC" to remain vital. Flash forward to 2014 and much of that area is still beset by struggle. The 53206 zip code in particular remains the most impoverished in the city. In fact, every economic indicator in a new study of the neighborhood showed things have gotten worse since the beginning of the millennium. The employment rate for working-age (20-64) males in 53206 is only 36.3 percent, less than half the metro area average. Moreover, that rate declined significantly between 2000 and 2012. The number of jobs in 53206 declined by 6 percent between 2002 and 2011. Workers in 53206 have longer commutes than most metro area workers, and rely considerably more on public transportation. 53206 residents make up only 8.6 percent of the employees at workplaces in the zipcode; the vast majority (62.7 percent) commute from the rest of the city of Milwaukee. The poverty rate in 53206 stands at 47.7 percent (up from 39.2 in 2000). Two-thirds of the children in 53206 live in poverty. Founding Director at UWM's Center for Economic Development and author of the study, Marc Levine, explains why there was an assumption that the region would recover, and where he believes the assumption was flawed. "There was this notion that there were certain competitive advantages in geographic location and in the density of the population in the zip code that could be the springboard to economic development," Levine says. "And, certainly location is a factor but it has to be combined with other initiatives that would maximize that locational advantage and link it to other regional development issues." 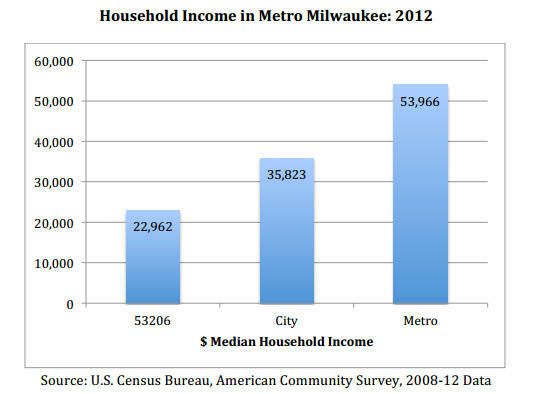 Median household income in 53206 is only 42.5% of the Milwaukee metropolitan area median. Levine says one of the other erroneous suppositions was that the area's aggregate - or combined - purchasing power would inspire retailers to open up shop there. "People don't buy in the aggregate," Levine says. "Obviously, the community doesn't get together and say, 'as a community, let's buy a couch,' or 'let's buy groceries.'" "I think the city kind of dropped the ball on some of the other policy interventions that might have raised the economic profile of the neighborhood," Levine says. "The strategic perspective, I think, that we've been taking is essentially a market-driven approach - as opposed to strategic public investments, links to regional economic development strategies and transportation investments." The city hasn't been the only force trying to revitalize 53206. Community members have started initiatives themselves, including mentorships, special high school programs and neighborhood associations. In the final phase of our Project Milwaukee series on black men in prison, we’re examining efforts to reduce the numbers. The Washington Post recently created an interactive map that lays out, by zip code, where the nation's richest and most educated populations reside.